It’s 3 am. I’m in a wetsuit, in my swimming pool, with a full-grown Blacktail doe deer, a ladder, and various pieces of deck furniture. Ten minutes earlier, my husband Luke and I, sound asleep, were startled awake by loud thrashing, almost a ripping sound, or clattering, like something or someone flinging the outdoor furniture around on the back deck, directly outside our bedroom sliding door. Bear? Human? Alien? Leaping out of bed, grabbing our flashlights, we peered out the glass door and saw…absolutely nothing. The furniture was all in place. But the racket hadn’t stopped. WTF? 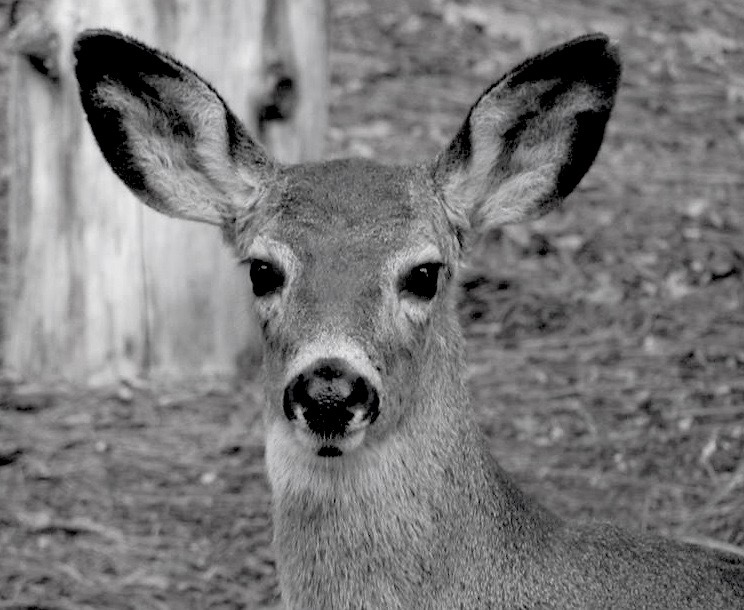 Then we noticed there was great turmoil going on in our 32′ above ground pool, a veritable tempest, and then, amidst the waves and crumbled solar pool cover, we saw the doe’s head pop up, eyes wide as could be. As we stared in disbelief and dismay, she would manage to get her front feet up on the metal rim of the pool–the origin of the clattering–but she didn’t have the strength to pull herself out. Mature Blacktails can easily make a 5ft ft leap, and more. But starting out in 4ft of very cold water, with a straight wall, apparently not so. This, of course, was quite the dilemma. We briefly contemplated how this event had occurred–something was chasing her, she assumed the solar cover was solid ground–but we quickly moved on to finding a solution. First action was to pull the solar cover off the water, so the doe wouldn’t get trapped under it. Then what? Put some furniture into the water. She’ll be able to stand on it and jump out. So we dropped in a wicker table. It floated. We added two metal chairs. They sank, but with their plastic basket weave seats, we realized they were not going to be useful. Her feet would just slip through. And the doe wasn’t having anything to do with any of it anyway, continuing her attempts to launch herself over the side of the pool over and over. It was horrible to witness, and we feared that in no time at all she was going to break a leg. We had to come up with something else. And that was create a ramp, and then get in the water and herd her to the ramp. But the water was freezing cold. Then, I remembered the wet suit, the heavy neoprene wetsuit. Feels like armor on. A friend had recently loaned it to me. Luke was insisting he was going to get in the pool with me. As he was barely recovering from a nasty cold, I told him in just the proper tone of voice, No way, No how, buster. I could do it. I’ll get in, and herd her to the ramp, which we were going to create by adding our 8 ft ladder to the regular vertical pool ladder that is attached to the deck. So Luke ran to get the ladder. I got the wetsuit. He helped me into it, I stepped down into the water, feeling no chill at all and rather invincible, positive this would work. It had to work. We situated the additional ladder in between the rail handles of the pool ladder. It was heavy enough that the end sank to the bottom, creating the ramp effect we had hoped for. How her little deer hooves were going to find purchase on the rungs…well, they would have to. The doe, meanwhile, was showing signs of exhaustion. I tried to herd her towards the ladder, but she veered away, to make another attempt at the wall. I came up behind her, and tried to assist by pushing against her hind quarters with my shoulder. She got higher up than before, but the metal rim was too slippery, she fell back heavily against me, but fortunately didn’t hurt me. The herding idea was not going to work. She was swimming around in the middle of the pool, so I slowly approached her, talking softly, explaining our grand plan, and came up beside her. She slowed, and I gently place my right arm over her back, my left against her shoulder. She accepted it. It was so amazing. She was large–I’m betting a good 120 lbs–fit, well fed, healthy. I turned her towards the ladder, she swam calmly, I kept my arms in place, and she let me guide her. When we got to the ladder, however, she panicked again, thrashed, turned away. I didn’t try to stop her. Waited a bit, then approached her once more, told her this was really was the best chance we had, the only chance, so we were gong to try again. Placed my arms around her again, and guided her to the ladder once more. This time when we got to the ladder, she went straight to it, and did not turn away. With a look of great determination…or so I fancied… she lunged, got her front feet on the metal rim. At the same time, I was pushing and shoving with equal determination against her rump. Her hind feet made contact with one of the ladder’s rungs. She seemed to take a breath, made another lunge, got her front feet up to the wood of the deck, me still shoving behind, and then with one last huge effort, she dragged her soaked and bedraggled body onto the deck, and just stood there. For a few moments, aside from the sloshing water, nothing moved…me still in the pool, Luke standing near the doe, the doe breathing hard, her back a little hunched up, her ears drooping. Then she started to walk, slowly–without limping, we were relieved to see–over to the small gate which she had come through onto the deck only about 15 minutes earlier. Luke shone the flashlight for her as she walked down the two steps to the lawn, and then trotted off into the dark. We got everything out of the pool. Luke helped me out of the wetsuit, and I took a very hot shower for a very long time. Never did get back to sleep. Came up with a name for her, however. Esther. Esther Williams.